On the 20th we were due to fly early to Cusco and catch a taxi down to Ollantaytambo (Oy-an-tay-tam-bow). We hopped in taxis and sped there through the continuing fog, only to find that the flight was at risk of cancellation due to the weather. Still hoping, we waited in the coffee shop, and then the departure lounge… until… oh dear, cancelled. Fearing we wouldn’t make it to Machu Picchu for Sunday, we queued to secure flights the next day and headed back to hotels. But.. oh dear… Ma, Pa and Dan’s hotel was booked out. With MP in mind, we hatched an alternative plan to get to Ollantay that day. “Just get on with it” we thought. 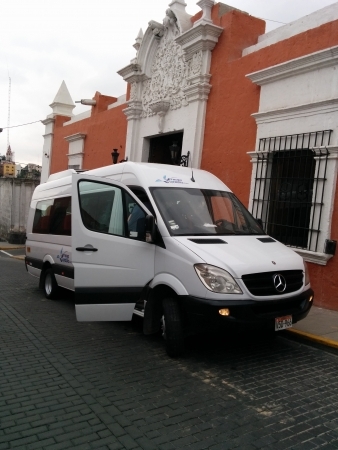 Dan contacted the tour agency that took us to Colca Canyon and we rushed to secure a 6 seater van and driver. 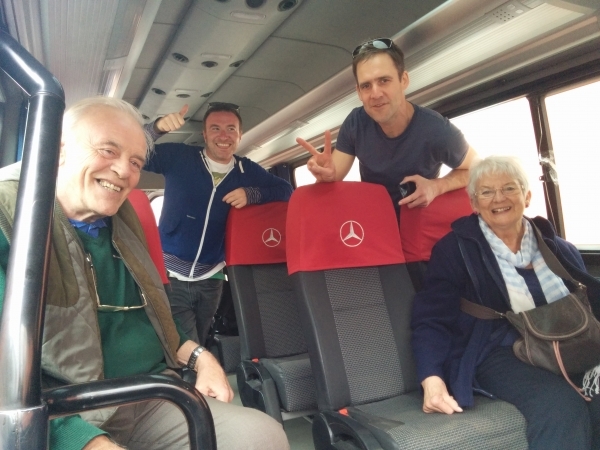 An hour later, we were in a 16-seater Mercedes – all to ourselves – the Penny Wagon! Adventure! In a really comfortable, safe way. …. off we went through the fog, up and out of Arequipa, watching the World go by out of huge windows and each with our own seat. The scenery changed from muddy town (playing “Dogs on Rooves” cricket – 2 points for a dog, 6 points for a collar, white dog and you’re out), to open expanses of scrubland with vicuñas and llamas and alpacas. We pit stopped after a couple of hours to grab a coca/mint tea, use the loos (the standard lack of loo seat and cold porcelain probably a new experience for some! ), and buy a couple of warm alpaca cardigans for the ladies. We carried on through rural Peru. Huts were few and far between, no electricity or running water, just the pens for llamas/alpacas and a basic roof over the head. Stopped a couple of times for loo breaks – once to be turned away by a couple of VERY drunk guys living it up in corrugated iron. Very chilly and barren up here. We drove through towns dotting valleys and on to Jualica – TERRIBLE roads in the town, and an odd route to take, but apparently necessary due to bad roads on the more direct approach. Edgar nimbly manoeuvred past an upturned bus in the road, through boulder slides and, after I’d tried a few uncomfortable sleeping positions, we finally arrived 11 hours later at 12.30AM. Mum and Dad were deposited at El Albergue through pouring rain, and we woke up the owner at Casa del Abuelo to let Jim and I in to our place. Straight to bed! On reflection, we didn’t just have an unexpected adventure, but Mum and Dad got to see a side of Peru they had been missing. In the cities and towns a lot of the customs and traditions are understandably lost to the trappings of modern life. The only glimpse you get is when locals tout it for tips (dressing up in traditional costume for photos, busking, or setting up artesana shops for baby alpaca goods etc). But in rural Peru everyone still uses adobe for houses, has chicha red flags outside the ‘bars’, paints politician’s names on their walls, wears their large skirts and unique hats to identify themselves, chews their coca leaves and brings their bulls/sheep/donkeys home at night from the vast land. I always like a bus journey for a glimpse behind the curtains.